If you've watched the pros play on TV, chances are they were playing 9-Ball. The game of 9-Ball is a games where position and strategy mean everything! It is an extremely fast paced game. In 9-Ball, the balls are racked in a diamond, with the one ball at the front apex. 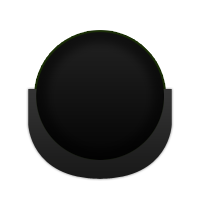 The nine ball goes in the center. The balls are broken by striking the one ball, and attempting to pocket a ball. The lowest numbered ball on the table must be struck first in order for the shot to be legal, and from there a ball must be pocketed or driven to a rail. The object of the game is simple: Run the balls out and pocket the nine ball, or shoot a combo that legally pockets the nine ball. Do this before your opponent and you win the game. APA "Amateur" 9-Ball is played like Professional 9-Ball...but scored like Straight Pool. In APA 9-Ball all balls have a point value. 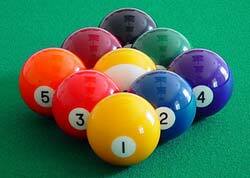 The balls numbered 1-8 are worth one point each... the nine ball is worth two. This makes each rack worth a total of 10 points. Players compete not to win games but rather to score the most points from each rack. Under The Equalizer® in 9-Ball, players are assigned a certain number of points (balls) to make. A lower ranked player, would need to pocket few balls than a more skilled opponent. Because every ball counts, the more skilled player cannot simply win by pocketing the nine ball, they must be aware of all the balls on the table and make every shot count. APA 9-Ball leagues use a wider range of skill levels. Players are ranked from SL-1 to SL-9. This wider range allows for greater accuracy when determining a player's ability, and creates a more competitive environment where all players have an equal chance of winning. Teams try to win as many of the weekly match points as possible. At the end of the session, those teams with the most points, plus one wildcard, advance to playoffs. The team that wins playoffs then advances to the 9-Ball Tri-Cup Tournament for that session and then the 9-Ball Local Team Championships for the chance to win travel assistance and a spot in the National Team Championships in Las Vegas.